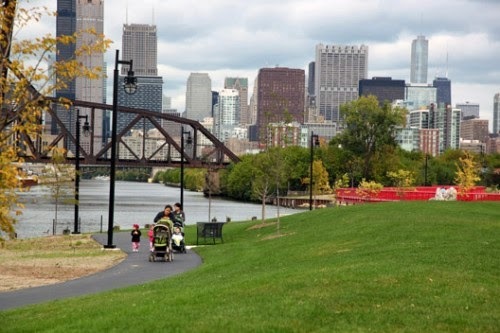 On this day, March 13, nearly a quarter-century ago The Chicago Tribune reported Mayor Richard M. Daley’s had endorsement of a new set of guidelines for development along the Chicago River, expanding a 1982 plan proposed by Mayor Jane Byrne. In the 1990 proposal Mayor Daley said that the Chicago River should become the “centerpiece and not the edge of downtown development.” He said further that he would ask the City Council to incorporate the guidelines into the zoning process. Today as work begins on an extension of the riverwalk westward to Lake Street, it is hard to imagine that back in 1990 any vision of a stroll along the river seemed like a fairly far-fetched scheme, but Mayor Daley suggested that his vision was to allow folks a “continuous greenway along the water’s edge that would allow the public to stroll from Lake Michigan to the western fringes of downtown,” according to The Tribune. Although the language in the plan carefully avoided absolute mandates, there were a number of features that over time would be adopted and are taken for granted today. Developer John Buck was even farther out there as he spoke of the plan, saying, “Eventually we’d like to see a riverwalk from Chinatown to Lake Michigan.” Once again, this was an unimaginable, almost laughable, plan in 1990 but with the parkland adjoining the river at Ping Tom Park growing northward, and the plan for the river’s south edge on the main branch headed westward, it’s not difficult to imagine that one day Mr. Buck’s vision will come true. The plan for the proposed Riverwalk extension on the Main Branch can be found here. What a great visionary. It will be wonderful to see this completed! 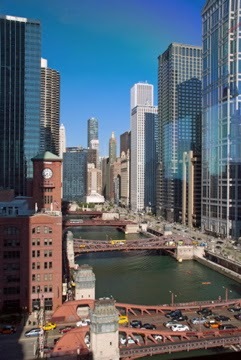 Thanks for reminding everyone how warm and wonderful Chicago can be in the summer! But Maybe the River's Time Finally Has Come . . .